Sumabe® Royal Jelly may assist in the maintenance of a healthy cardiovascular system and supports healthy immune function. Royal Jelly helps in the maintenance of general well-being. Adults: Take 1-2capsules daily, with meals, or as directed by your healthcare professional. Not suitable for children. 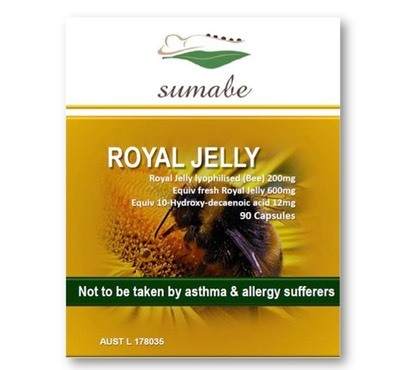 This product contains royal jelly which has been reported to cause severe allergic reactions and in rare cases fatalities -especially in asthma and allergy sufferers. Royal Jelly may assist in the maintenance of a healthy cardiovascular system. Royal jelly is a honey bee secretion that is used in the nutrition of larvae, as well as adult queens. 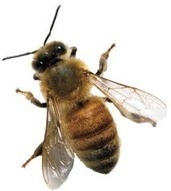 It is secreted from the glands in the hypopharynxof worker bees, and fed to all larvae in the colony. When worker bees decide to make a new queen, either because the old one is weakening, or was killed, they choose several small larvae and feed them with copious amounts of royal jelly in specially constructed queen cells. This type of feeding triggers the development of queen morphology, including the fully developed ovaries needed to lay eggs. Royal jelly has been reported as a possible immunomodulatory agent in Graves' disease. It has also been reported to stimulate the growth of glial cells and neuralstem cells in the brain. To date, there is preliminary evidence that it may have some cholesterol-lowering, anti-inflammatory, wound-healing, and antibiotic effects, though the last three of these effects are unlikely to be realized if ingested (due to the destruction of the substances involved through digestion, or neutralization via changes in pH). Research also suggests that the 10-Hydroxy-2-decenoic acid (10-HDA) found in royal jelly may inhibit the vascularization of tumors. Royal Jelly is said to improve fertility in both men and women, in men by increasing the quality of their sperm, and in women by increasing the quality of their eggs. There are also some preliminary experiments (on cells and lab animals) in which royal jelly may have some benefit regarding certain other diseases, though there is no solid evidence for those claims, and further experimentation and validation would be needed to prove any useful benefit. Royal jelly can also be found in some beauty products. Royal jelly may cause allergic reactions in humans ranging from hives, asthma, to even fatal anaphylaxis. The incidence of allergic side effect in people that consume royal jelly is unknown. However, it has been suggested that the risk of having an allergy to royal jelly is higher in people who already have known allergies. In patients with bronchial asthma royal jelly should not be taken during the attack. In the literature we found data that suggests that there are reported cases of fatal outcome when, in the course of the attack, royal jelly has been taken.